The ruling Military Council (Scaf) has launched a number of very serious attacks on the Egyptian Revolution over the last week. The military police can now arrest civilians at will and parliament has been dissolved. The generals have also announced additions to the Constitutional Declaration of March 2011 which give them virtually unlimited powers. We have to understand that this military coup has been in the making for a long time. What happened during the last week was the culmination of a process that had been going on for months. The problem became visible with the reaction to the sentencing of former dictator Hosni Mubarak on 2 June. The protests were not strong enough—they were much smaller than before. The mass movement had retreated. So Scaf believed it could act without facing a strong reaction. 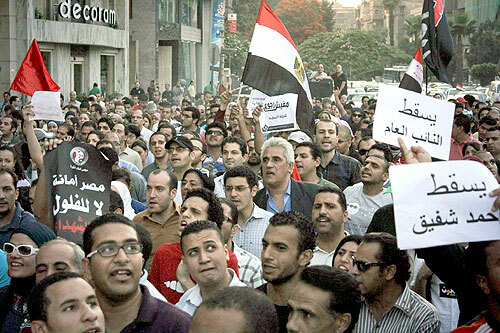 The generals’ growing confidence led them to think they could take on the Muslim Brotherhood. For most of the last year the Brotherhood has worked closely with Scaf, but now it is under attack. The last round of the presidential election pitted Mohamed Mursi of the Brotherhood against the generals’ candidate, Ahmad Shafiq. We don’t have official results yet, but Mursi appears to have won. We don’t equate Mursi and Shafiq. The Egyptian Revolution was a popular revolution, which involves a broad spectrum of forces from the right to the far left. The Muslim Brotherhood represents the right wing of the revolution. It is not the counter-revolution. It saw the fall of Mubarak as an opportunity to work with Scaf so the Muslim Brotherhood could take a role in government. So since 11 February 2011 the Brotherhood has been a conservative organisation. But Shafiq is the counter-revolution. That is why we are mobilising for protests against the military coup alongside the Brotherhood. Most political forces are taking part. We are calling on revolutionary forces to build a mass movement against the coup and the changes to the Constitutional Declaration. However we believe that the role of the workers’ movement will be critical in the coming months. Workers’ demands for social justice remain unmet, and whichever candidate becomes president will have neither the desire nor the means to meet them. Socialists have a crucial role to play in helping build up workers’ organisations which can confront Mubarak’s regime and get rid of capitalism itself.